We love our new outdoor kitchen built by Elegant Outdoor Kitchens! Andrea, Ben and their team were wonderful to work with on the project and completed it ahead of schedule. We highly recommend Elegant Outdoor Kitchens of Fort Myers, FL. Are Outdoor Kitchens Worth the Investment? One of the most popular areas of the home that is frequently upgraded by homeowners is the backyard or outdoor living area. On average, most can fetch a return on investment (ROI) of as much as 70–80%. I don’t know about you about you, but I like those odds. The outdoor kitchen upgrade and build serve a dualistic purpose to the homeowner. First, it can serve as a place where you’re able to entertain both family and friends, creating moments that truly make a home, a home. Second, and one of the most exciting aspects to the financially savvy homeowner is the return on investment or ROI. MSN real estate experts suggest that building an outdoor kitchen can get you about the same if not more return on investment when reselling your home. Other experts suggest you can get more for your money; Zing adds that CNN Money suggested that some outdoor kitchens can fetch a 100–200% ROI. Further, it’s also an excellent way to add buyer appeal to your home investment. It’s safe to say that building that outdoor kitchen you’ve been considering is a sure fire way to bring both financial and entertaining value to any residential home. 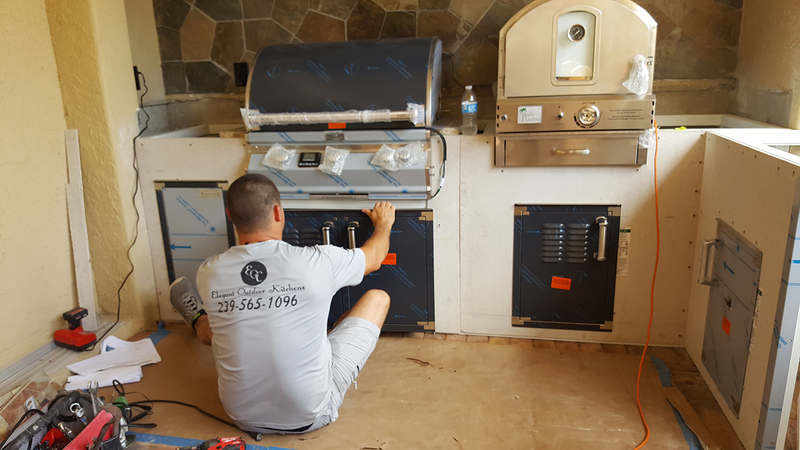 If you’ve been thinking about an outdoor kitchen build and would like to start by getting some valuable information, we invite you to schedule a no-risk outdoor kitchen design consultation. 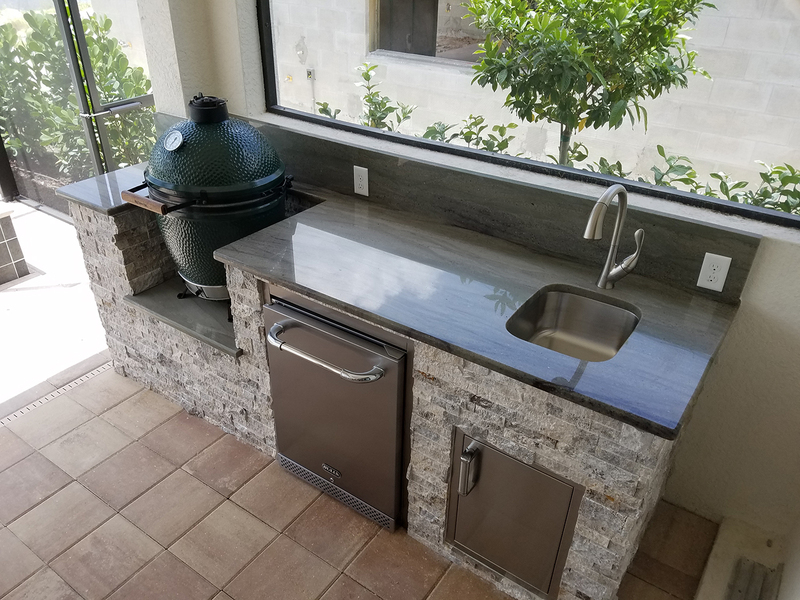 The pros from Elegant Outdoor Kitchens are here to answer any and all questions you might have about both the design, and the construction of your potential BBQ island addition. Want to see what we’re capable of building? Excellent, we love showcasing the work we do. Below you’ll find a link to some of the existing projects we’ve developed. Check out our beautiful portfolio, then give us a call to schedule an in-home visit. Give Elegant Outdoor Kitchens a call today to schedule an on-site design consultation. From concept to completion, we’ll ensure you get the maximum ROI through our quality outdoor living area design and manufacturing. If you’re not interested in waiting, and you would like to contact Elegant Outdoor Kitchens now, go ahead and fill out the form below to schedule an on-site design consultation. Don’t just trust anyone to build your outdoor living area, trust the tried and true pros from Elegant Outdoor Kitchens of Fort Myers, Florida. You wouldn’t just let anyone build you a home, right? The team here at Elegant Outdoor Kitchens will help you understand your options when it comes to both the construction and the excellent components that are available to you. When you choose EOK, you can rest assured that you’ll receive nothing less than the absolute best construction and guidance. From concept to completion, we’ll make sure you get exactly what you’re looking for in a custom barbecue island build. Believe it or not, there’s a lot to consider before building a custom outdoor living environment. Not only are you adding a physical structure to your home, but you’re also increasing the value of your home in the process. These are important decisions, decisions that should be made with a professional outdoor kitchen design company. Allow us to help you with a one-on-one outdoor kitchen design consultation! Planning is the cornerstone of any construction project. We invite you to schedule an on-site design consultation to start the planning process. The benefits of working with our design team are immeasurable. It all starts with first understanding what you want. Once we understand your goals, we set out to provide you with aesthetic & functional design options for your project. From natural finishes to professional barbecue grills & layout configurations, we design with you in mind. It’s safe to say that knowing what’s available to you is half the battle when it comes to building an outdoor kitchen that you’ll love. Building a custom outdoor living area can be a significant task. Let’s face it; it’s a major addition to your backyard and home. Barbecue island design and construction is what we do here at Elegant Outdoor Kitchens. Our team is happy to assist you, every step of the way. Give us a call today to schedule an on-site design consultation. Our tried and true design process will ensure that you get the outdoor living area you’ve always dreamt of owning. When it comes to grilling, the modern outdoor kitchen and living area can do everything your indoor kitchen can do, and more. The team here at Elegant Outdoor Kitchens is here to help you create the ultimate outdoor entertaining area. Whether you’re into small intimate family gatherings or huge outdoor parties, we can help. We understand the significance of outdoor grilling, it’s been a part of our American lifestyle and culture since the 1950’s. Our outdoor kitchen consultants are here to help you design and build your brand new custom outdoor kitchen, from concept to completion. We’ll work closely with you to construct an outdoor living area that will have your neighbors begging to be invited to your next barbecue. Which type of fuel source do you want to use? Liquid Propane (LP) or Natural Gas (NG)? Will you require running water for a built-in outdoor faucet and sink? Do you have a specific area of your property where you would like the outdoor kitchen built? What type of equipment do you want in your outdoor kitchen area? Do you want a traditional barbecue grill, pizza oven, smoker, or any other type of cooking platform? What type of finishing materials would you like to use for your barbecue island? What’s your budget for the complete project? These are just a few preliminary questions that you’ll want to answer before starting the construction. Elegant Outdoor Kitchens can help you with all the important planning and construction. We’re here to assist you with the entire process. Give us a call today to schedule an on-site design consultation. What to look for before you buy a professional outdoor grill. Your outdoor kitchen’s primary feature is the barbecue grill. We recommend starting with this article from Elegant Outdoor Kitchens of Southwest Florida. There’s no shortage of options when it comes to a professional grill for your outdoor kitchen island. There are a few things you’ll want to consider though. The last thing you want to do is choose a grill that will only last 2-3 years. We call these types of grills “throwaways”. We won’t be mentioning those grills in this article today. What we will be doing is giving you a few pointers that will help you during the selection process. 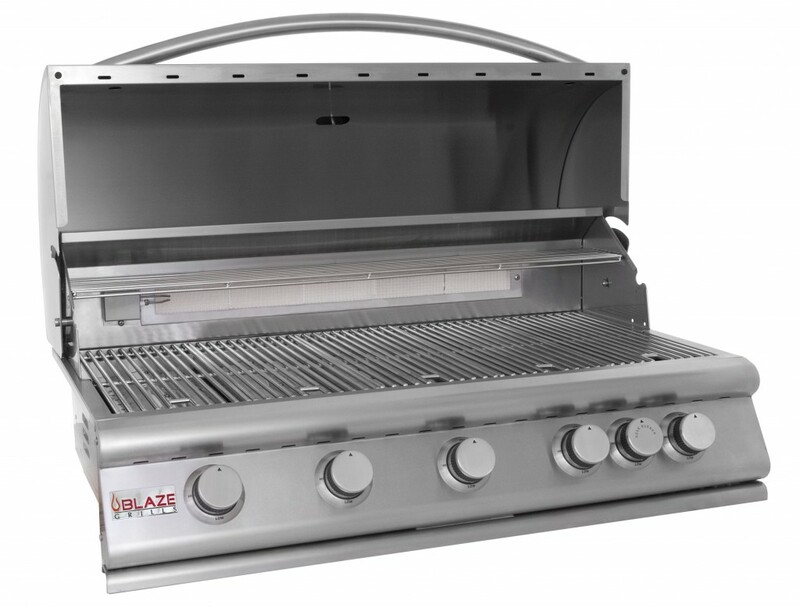 304 Stainless-Steel is the industry standard when it comes to professional barbecue grills. Structural integrity of your grill is extremely important, the last thing you want is for your grill to start rusting and breaking down inside your new barbecue island. The goal of building a custom outdoor kitchen is to get as many years out of it as possible. The professional grills we’ll be talking about today have a lifespan of around 10 – 15 years. The nice thing about a professional grill is that they are just like vehicles, if a part breaks, you’re able to replace it. We’ve seen customers with professional grills as old as their automotive vehicle. There’s quite a few great barbecue grill manufacturers on the market today. It’s always best to start the process by talking with a professional within the industry. 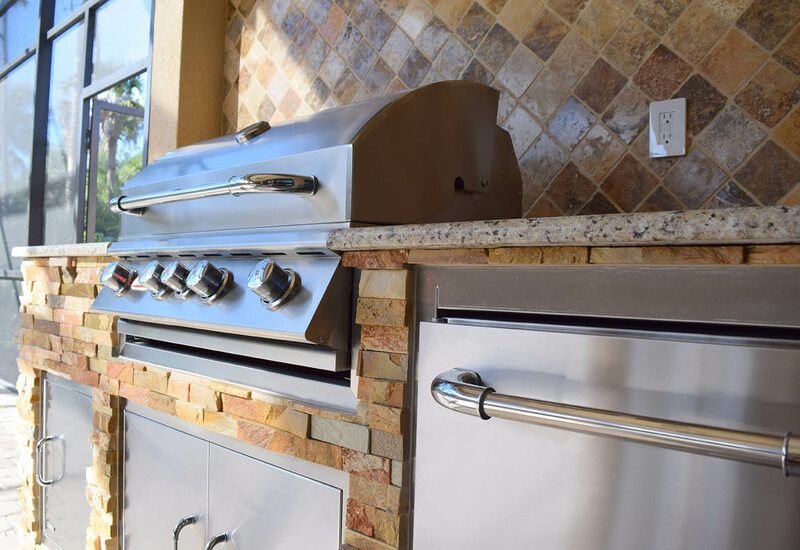 We’re Southwest Florida’s outdoor living specialists and we’re here to help you design and amazing outdoor kitchen environment. Give Elegant Outdoor Kitchens a call today! All in all, you’ll want to make sure that the grill you purchase for your barbecue island is made of stainless-steel. Most popular grill brands have standardized grill sizes too. So, when it comes time to replace the old grill, the chances are high that they will have made a newer model in the exact same size or cut-out size. Your BBQ grill burners are another very important feature that you’ll want to understand. What metal the burners are manufactured out of as well as their lifespan. Grill burners are constructed from range of materials, cast brass, cast iron, 304 stainless-steel, and infrared (which is a type of burner, not material). Leading grill manufacturers usually use cast brass burners. Cast brass burners are considered to be superior in many ways. They’ll usually last as long as the grill itself. BTU: A British Thermal Unit (BTU) is the amount of heat energy needed to raise the temperature of one pound of water by one-degree Fahrenheit. This is the standard measurement used to state the amount of energy that a fuel has as well as the amount of output of any heat generating device. 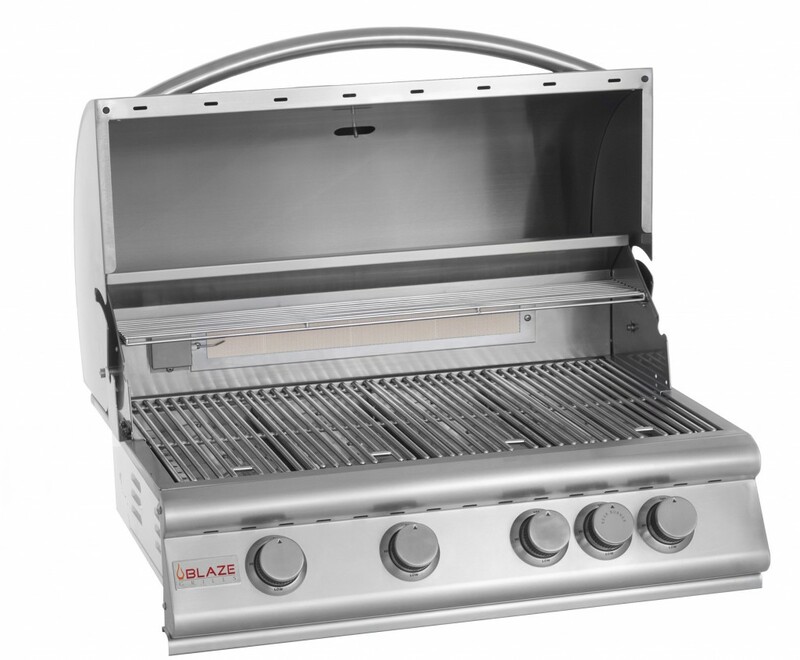 Your professional grill will have a BTU output associated with each burner. The number of burners your grill will have will range from 3 – 6. Entry level professional grills will usually have 3 burners, which is a very common configuration. BTU output per burner can range from 10,000 to 20,000 depending on the grill manufacturer. Most of the professional grills on the market today will also come with an infrared rotisserie burner in the rear wall of the grill. The infrared rotisserie burner is usually built-in to the grill, but some companies will charge extra for the rotisserie motor as well as the spit. The grilling surface is another extremely important feature of a professional barbecue grill. The barbecue grill surface will be measured in square inches. It doesn’t take a rocket scientist to conclude that more grilling surface is beneficial. The grilling surface or area depends on the barbecue grill you purchase. A great question to answer before purchasing a grill is, “How many people will you be grilling for?” This answer will give you a better idea of what grill range you should be considering. Another important aspect of the grilling surface is whether the temperature is consistent throughout the entire surface. Does the barbecue grill have cold spots? You can research on the internet to see what people are saying about any grill on the market. The primary objective is to purchase a barbecue grill that evenly distributes heat to its grilling surface. The surface being the grill grate/s, the grill grates also can vary in size and material used in its manufacturing process. Grill grates can be made of porcelain enamel coated steel wire or porcelain enamel coated cast iron. From LED lighting, knobs, ignition systems, wood smoking trays, and so much more, the industry is massive and competitive. There’s a huge range of features that you can purchase in a professional barbecue grill. Some grills come with built-in side burners and other handy add-ons. What it really comes down to is making sure you choose a professional grill that will last the next ten years without any hitches. We recommend speaking with an Elegant Outdoor Kitchens professional about your options. 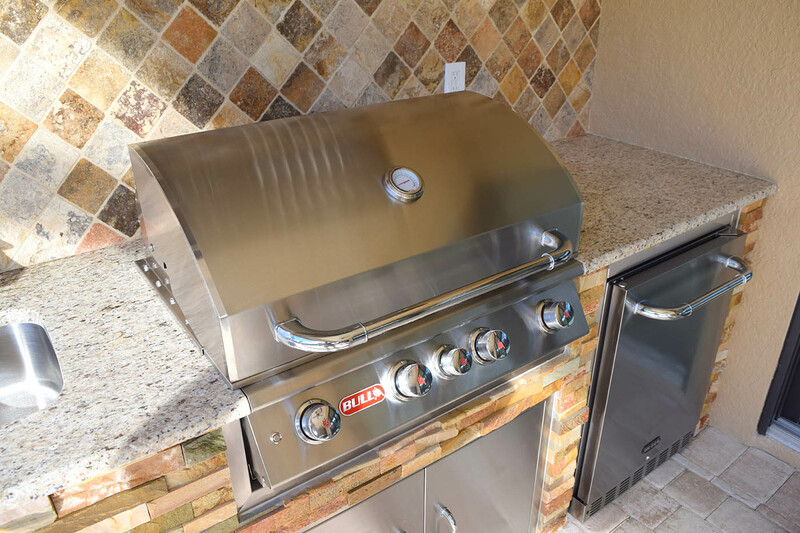 Our team will help you choose a grill that makes the most sense for your outdoor kitchen space and configuration. Schedule an on-site consultation with the pros here at Elegant Outdoor Kitchens. We’ll guide you through our outdoor kitchen design process, we’ll make sure you get the outdoor kitchen you’ve always imagined. Give us a call today to start building! Call Elegant Outdoor Kitchens Now! Are you in the market for a custom BBQ island and outdoor living area? Well, we have the perfect construction guide that’s designed to give you an introduction to the process. The Elegant Outdoor Kitchens team has compiled a useful outdoor kitchen guide that will help you understand what to expect from a custom outdoor kitchen build. You’ll learn about design configurations, materials, grills, components, and so much more. Download your design guide below. Elegant Outdoor Kitchens – Starting Your Outdoor Kitchen Construction Project Guide. Custom Outdoor Kitchen plans can be as simple or complex as you desire. The one physical factor that keeps many of us from designing the ultimate outdoor living area is space. Chances are that you have a limited amount space or physical area to work with. Unless your last name is Rockefeller, then you just got it like that. The other factor tends to be budget. While this list is anything but extensive, almost every custom outdoor kitchen layout is based off one of these basic models. Depending on the area you have, we’re certain that you can convey to your EOK Designer which type of design configuration you want through the base styles mentioned. The best part of designing an outdoor kitchen is the customization. BBQ Island designs are customized with everything from backsplashes, raised bar areas (split level), dining areas, even fire features built right into the counter-top. The list is quite endless when it comes to structural customizations. This section of the brochure will prepare you to talk the talk with your designer. When working with Elegant Outdoor Kitchens, you’re able to choose the unique finishing materials for your brand-new custom outdoor kitchen. When it comes to your finishing material options, the material choices are quite extensive. It’s important to understand that inferior materials and craftsmanship will deteriorate quickly in an outdoor environment. During the layout and design phase you will have already decided on how much counter space you have to work with. Countertops are important, as you will need them to prepare food, serve food, and ultimately use as a space to set stuff down. The material you choose for your countertop is an important one. You should consider that it will be exposed to outdoor elements, it can’t stain or chip easily, and it should match your siding. Luckily there are many options when it comes to countertops. The best choices are going to be materials like natural stone, concrete, or an outdoor tile. It’s best to speak with an Elegant Outdoor Kitchens representative before purchasing any materials for your countertop. The siding finish is what you and your guests will immediately notice about your outdoor kitchen. That’s why this finish should be considered carefully. It’s always a good idea to choose a finish that matches your overall outdoor environment and your countertops. 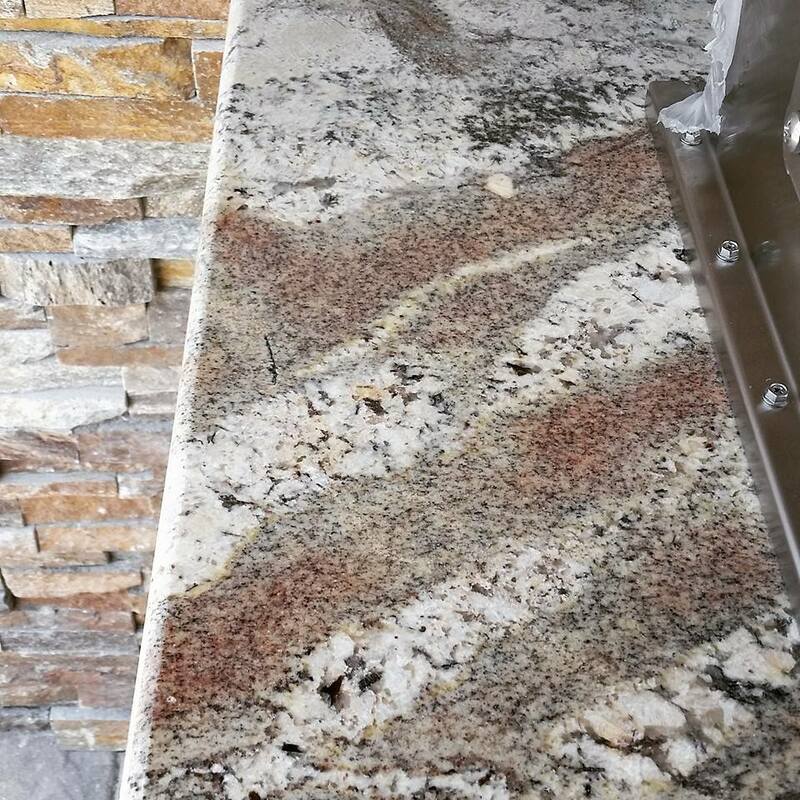 Stone veneer, also known as stacked stone is an upscale and popular outdoor kitchen finish. When choosing a veneer, you must consider your climate and the weather it will be exposed to. What you will have to choose from will depend on your environment. Speak with your Elegant Outdoor Kitchens representative about the material options that are available and suitable for your climate. They’ll be happy to showcase some of the beautiful materials you can use for your outdoor kitchen. 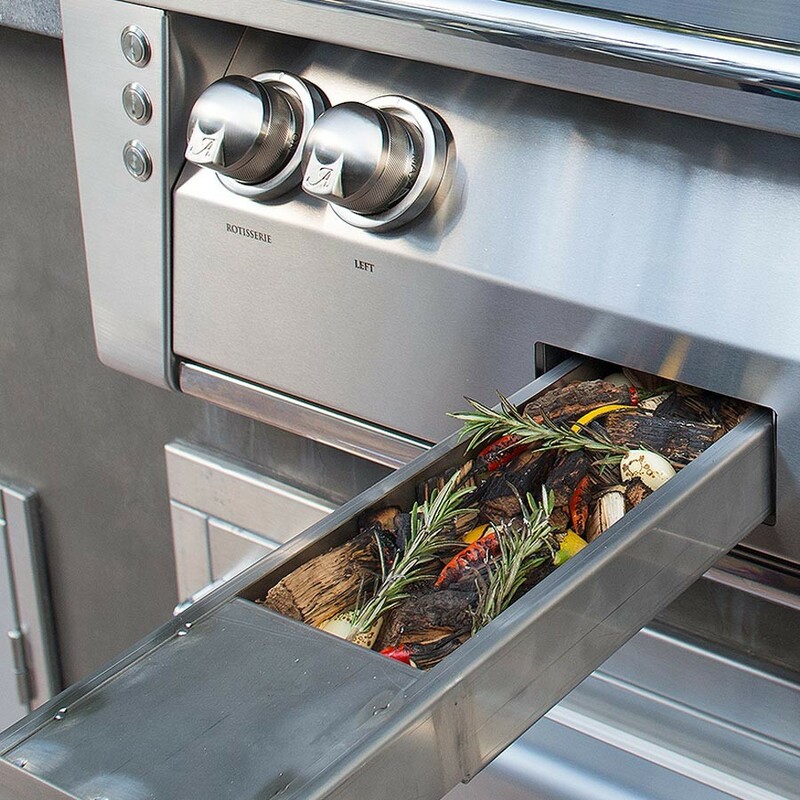 The best part of designing your outdoor kitchen is choosing from the amazing cooking & grilling components that are available today. The choices are vast and it helps to have an experienced outdoor kitchen consultant to help you realize your outdoor cooking needs. 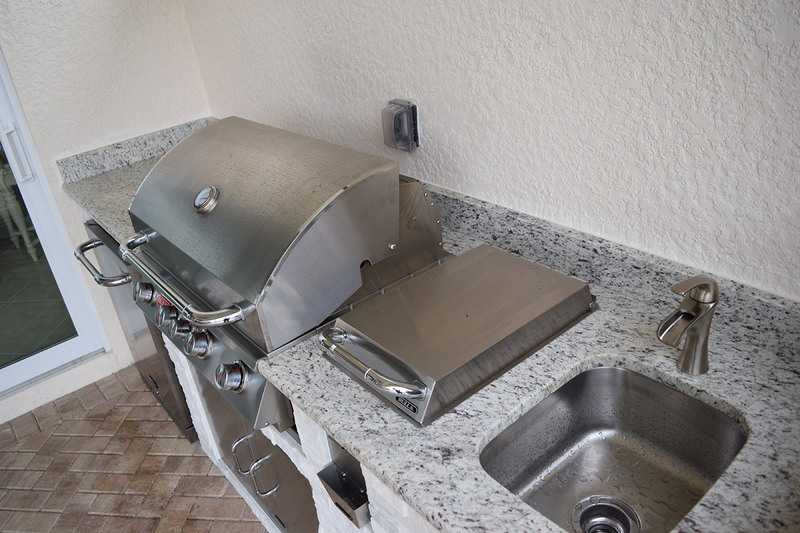 You must consider many factors when choosing your grill, stainless steel accessories, and secondary cooking components. Things to keep in mind are your budget and the space you have in your outdoor kitchen design. Let’s face it, an outdoor kitchen isn’t a kitchen without a professional grill. This will be your go-to cooking component for your outdoor living area. It’s important to make sure you choose a grill that’s durable, high performance, and will withstand the test of time. The last thing you want to do is build an outdoor kitchen with cut-out dimensions for a grill that will only last two years. What If the manufacturer goes out of business? Our recommendation is that you buy a professional style grill that will last you between ten to fifteen years. Plus, the performance you’ll get from a professional grill is unmatched when compared to some of the lower end manufacturers you find at places like Home Depot. From Pizza Ovens to Access Doors, Drawers, and more. Your outdoor kitchen can be outfitted with even more custom cooking components than your interior kitchen. There are very few limits to cooking outdoors. Speak with one of our Elegant Outdoor Kitchens designers to choose your custom accessories and additional cooking components. Designing and outdoor kitchen for your home is an exciting time. It’s important that you choose a company that will work closely with you to plan, design, and manufacture the outdoor kitchen that you’ve always wanted. Here at Elegant Outdoor Kitchens we pride ourselves on communication and customer service & support. Building your perfect outdoor kitchen means that we must first understand what you want in an outdoor living area. Give us a call or send us an inquiry through the form we’ve included below. We’re here to help you with all your custom outdoor kitchen needs. So, let’s get building!